Chanson Sporting Goods Co., Ltd. was founded in 1976 by the chairman Tsun-Jui Tsai. With over 38 years of experience, Chanson has developed a premier reputation within Taiwan’s sporting goods industry. Chanson is now a leading brand of high quality sports goods and fitness equipment for the home and commercial markets in Taiwan. With a unique marketing sense in product research and development, Chanson offers complete arrays of products in the industry including multi-station gyms, free weight machines, cardiovascular products, dumb bells, fitness accessories, and massage chairs/machines. Chanson also provides comprehensive customer services including fitness center planning, in home repair service, sports and health management which offers customized exercise prescription and personal training. Chanson is also a major manufacturer of billiard table, table tennis table, and billiard cue in Taiwan. Chanson’s high quality products are made in an ISO-9002 certified facility and are certified by ITTF, International Table Tennis Federation, and APBU, Asian Pocket Billiard Union. The headquarters of Chanson is based in Taipei, and the factory is located in Yangmei, Taiwan. The company has around 70 employees and over 600 dealers nationwide. Tsun-Jui Tsai was once a pool table and table tennis table apprentice. 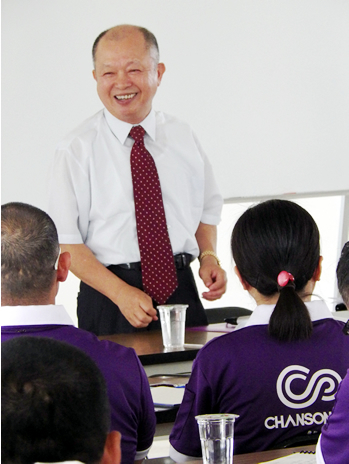 In 1976, Tsai started his business from scratch and founded Chanson Sporting Goods Co., Ltd. With high self-demand, flexible mind, and diligent spirit, Tsai made the company the fastest grown table tennis table manufactory within the industry and further established Chanson a leading brand of sporting goods in Taiwan marketplace. With innovative, professional, sincere, pragmatic attitude and down-to-earth business philosophy, Tsai aims to provide honest, fast, and efficient services and to create a healthy lifestyle to customers.